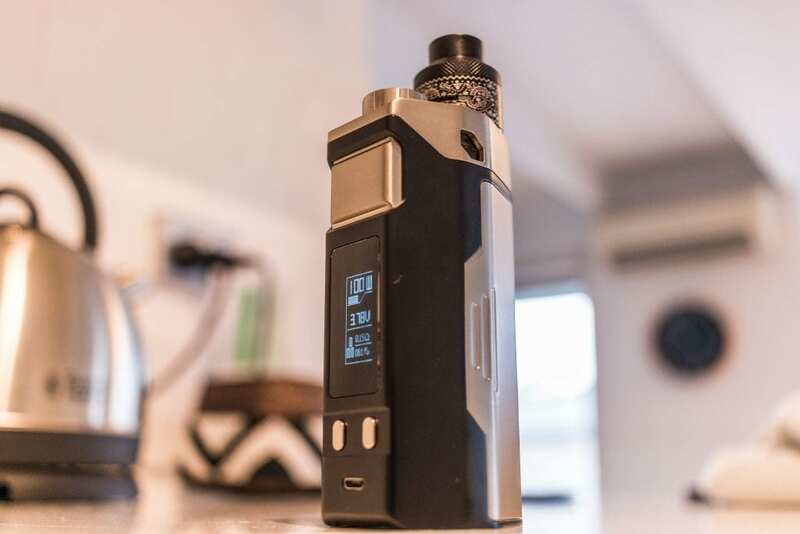 iJoy released the RDTA Box Mod Kit late last year and the hype around it seemed to disperse fairly quickly. In a follow up effort, iJoy have released the 240W IJOY RDTA BOX Triple TC Kit. The new triple kit is now powered by three 18650 battery cells and has boosted it’s overall output by 40 watts making a total of 240 watts on offer. 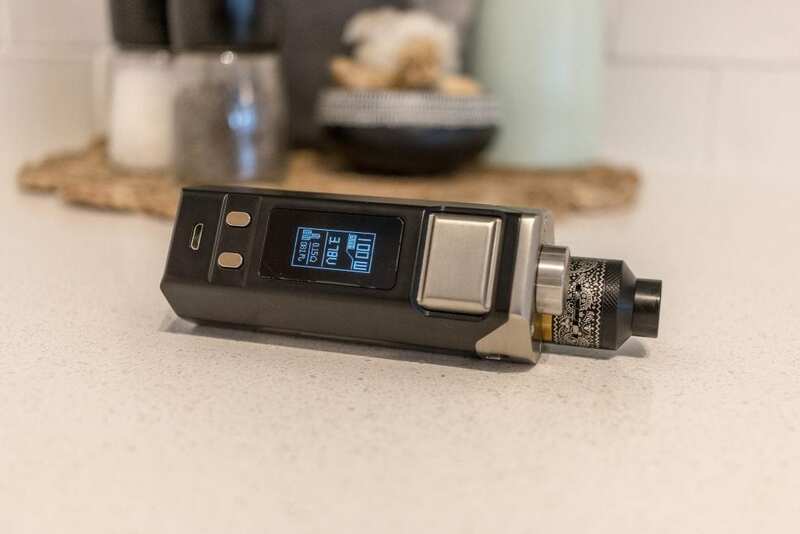 It features a whopping 12.8ml juice capacity, the IWEPAL chipset and a vast array of coil and deck options to choose from – not all of which are included as standard in this kit. As the RDTA Box Mod has already been reviewed on Vaping Cheap, this won’t be as in depth as usual. I would like to thank Heaven Gifts for sending us the 240W IJOY RDTA BOX Triple TC Kit for the purposes of this article. The package that the IJOY RDTA BOX Triple TC Kit comes in initially seems quite large, until you open it up and see how big the mod itself is. The outside of the box has a product picture on the front with fairly standard contents and write up on the back. The outer sleeve pulls off to expose another plain box underneath. This houses the mod in sufficient padding to ensure that it does not get damaged in transit. And underneath the mod sits all of the included accessories in the tray below. The packaging is neat and efficient. Upon taking the mod out of the box, it definitely feels solid and well constructed and alsoâ¦big. The RDTA on top has the familiar Limitless styled bandanna look, with two huge adjustable cyclops air holes on each side. The top is knurled which aids in adjusting the airflow and the drip tip is nice and compact. The base of the deck is gold plated and after you pull off the top cap you can see that the rest of the build deck is too. The outer ring and the deck are removable, which enables you to use any of the optional IMC build decks or pre made coils available separately from iJoy. The deck that comes installed on the IJOY RDTA BOX Triple TC Kit isn’t part of the IMC series and is upgraded from the previous RDTA Box mod. It features a two post design, with hollow threaded posts that are screwed down from the top around each post with a knurled cover on each, to provide tension on the coils and hold them in place. This looks like quite a good design and appears that it would be easy and straight forward to build on. The mod itself is quite visually appealing. It lacks in straight edges and all of the parts seems to flow into each other. On the face of the mod there is a huge over sized fire button, a large display screen, + / – buttons and a micro USB port. The other side of the mod features the batter door, which pulls straight out and is held in via magnets. The tolerance is quite good, not too hard to get off. It has the iJoy logo cut out of it, which also acts as some ventilation to the battery bay. The battery bay is neat and tidy with the orientation for each battery clearly marked. It does not have a ribbon to assist in removable of the batteries, letâs see later how easy they are to install and remove. Above the battery compartment is the 12.8ml juice reservoir. It has a viewing window on either side and apparently there is an LED light that illuminates within the chamber, when you hit the fire button, so you can see how much juice is left. The top of the mod features quite a large cap that screws into the fill port. The fill port is really big and would be able to accommodate any size bottle tip when it’s time to fill her up. The fire button and selection buttons are nice and clicky and feel quite responsive. There is also no rattle present throughout the entire mod. I didn’t detect any smell of machine oil in either the reservoir or the build deck. All in all this looks like a very well built and designed mod and tank package. It feels nice to hold and looks good too. My only concern is the size of this thing. A triple battery mod with a 12.8ml juice reservoir is always going to be a big package, however let’s see if this thing holds up and is going to be worth the real estate it commands. Installing the batteries is very straight forward on the IJOY RDTA BOX mod. The back door removes with ease and exposes the battery tray and identifies the orientation for each battery. The batteries are easy to both install and take out and they are held in quite snug which eliminates the chances of any rattle. We recommend using a marred trio of high amp batteries and you can brush up on our article on Battery Safety here. To install the prebuilt coils that come with the kit, make sure to remove the re-buildable deck section first. Simply screw them in, then the outer ring and you are good to go. The rebuildable deck is super easy to build on and there is plenty of room to tweak the build to your liking with such an exposed deck area. Simply screw up the post covers to expose the hollow posts. Install your coils through the posts and clamp back down the post covers so your build is held tight. Clip off the ends and position the coils to where you like them to be. Wicking is straight forward and can be done just like any other RDTA method you prefer. There is plenty of room to have your wick dangling down into the reservoir, which is great news. To fill the 12.8ml reservoir, simply unscrew the cap from the fill port and pour in your favorite e-liquid. The beauty about having such a large fill port is that you can fill this tank from larger bottles, not having to rely on smaller tip bottles or dropper applicators. You can see how full your reservoir is either from looking down the fill port or by looking at one of the juice level indicators on either side of the mod. A LED will illuminate the inside of the reservoir when you hit the fire button, so you can always very easily check the level night or day. Remember to prime up your coils and wick and your ready to start vaping. Five clicks will turn the mod on and off and three clicks will enter the navigation menu. The navigation is the same as the previous version so nothing new here. The mod supports both Wattage mode and TC mode with support for SS, Ni and Ti. You also have the option of entering 2 sets of custom TCR values to hone down on your favorite setup. There are a slew of safety mechanisms build into the mod which are all covered in the manual. I have to say that the performance and satisfaction level on the IJOY RDTA BOX Triple TC Kit is top notch. I get a really nice and satisfying vape with tonnes of flavor and plenty of vapor. The airflow is super wide and can be backed off very easily to balance the amount of flavor versus the cloud production. The fire button is very responsive and fires the coil very quickly with hardly any noticeable delay. The prebuilt coils perform very well and are a breeze to work with. Having three coils, there is a very saturated flavor that it produces, which I enjoy very much. The wick in the prebuilt coils have been installed very tightly, so there can be delay with re-wicking and chain vaping. I don’t think this would have been much of an issue if the wicks were just that little bit looser or not as much being packed in so tight. You could certainly re-wick them if you were skilled enough, however this seems beyond the point of pre-built coils to me. I tried the rebuildable deck with a number of builds. Mainly fused claptons and SS316 regular claptons are my go to. They all performed well in this kit and were easy to install and tweak to my desired sweet spot. There is plenty of room to work on this deck once the top cap and outer ring are taken away, so I had no worries getting all of my tools in there that I like to normally use. 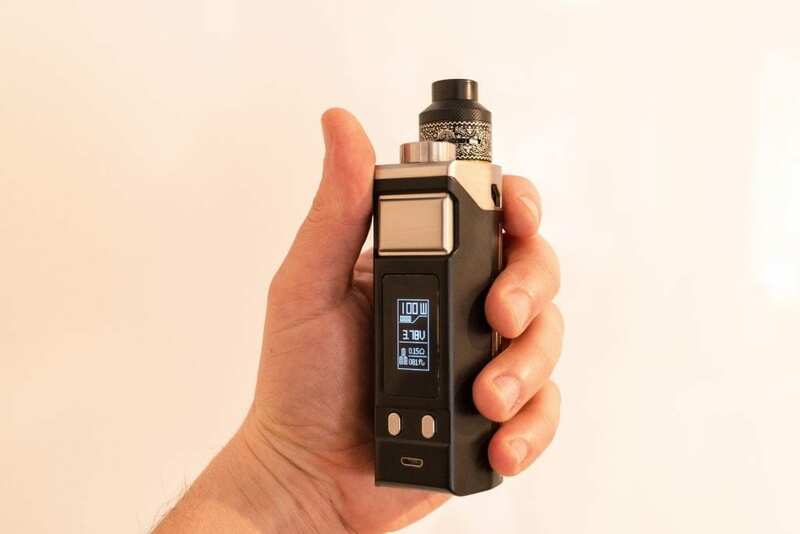 You can fit some big fancy builds in the IJOY RDTA BOX Triple TC Kit if that’s what you are looking to do with it. It will accommodate those with no worries, however I would be looking at getting one of the other IMC decks to make sure your large gauge wire will fit. As with wattage mode, TC mode worked as advertised and without any problems at all. Even the TCR modes performed as they should, so I impressed overall with the quality of the chip and how she vapes in general. Battery life is on par with most three 18650 mods available these days. Of course this is always subjective to your style of vaping and the builds you are powering, but I experienced no issues in terms of battery life here. 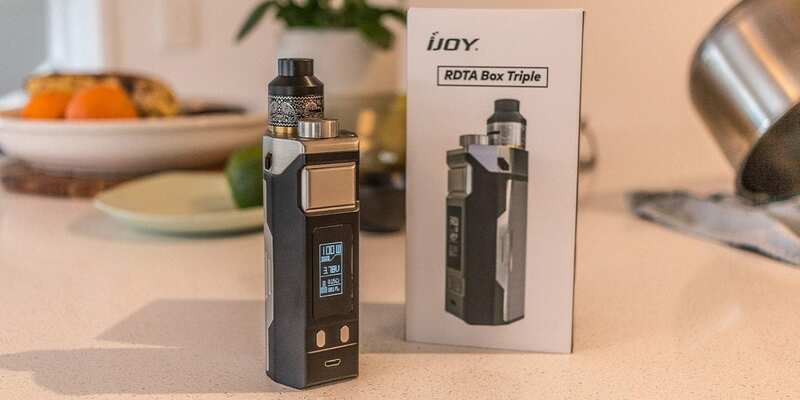 The IJOY RDTA BOX Triple TC Kit does not support charging via the micro USB port, so you will have to use an external charger. The micro USB port is designed for firmware upgrades, so that is a definite pro in my book that you can always download the latest version of firmware to support the chip. The display is quite large and displays all of the information you need it to in a very clear manner. It holds up to different lighting situations and you can easily see where you are at very quickly at a glance. My favorite thing about the on screen display is that it has a battery meter for each of the installed batteries. Navigation, both through the wattage/TC range and through the menu, is quick when you need it scroll and precise when you need it to be. It’s just about right and will not take any getting used to for dialing in your sweet spots. The accuracy of the ohm meter holds up with most of my other mods I checked it against. I didn’t get any ohm jumping or misbehavior out of the IJOY RDTA BOX Triple TC Kit. It performed as advertised and did not give me any unexpected issues. Does it fit in your pocket? No, most definitely not. Would you want to take it out with you? Maybe yes, it is quite a satisfying vape and being 12.8ml juice capacity it lasts quite some time before you need to refill. So it would be personal preference if you decided to take it out with you, you just need a big pocket or somewhere convenient to stow it while on the move. As a stay at home mod, no problems at all, it would make a great workhorse for your favorite vape spot at home. All in all I think the IJOY RDTA BOX Triple TC Kit is very good performer and will certainly satisfy the avid vape enthusiast. It will cater for re-builders and also those who just prefer to use pre-built coils. Keep in mind this is an all in one unit and you are unable to use different attys with the mod itself. So you are buying something to use as is, as a kit for its entirety. I think it looks pretty cool and while it is a big kit, it still would serve a purpose in my vape arsenal. For the money versus performance and satisfaction it puts out, I think it is definitely worth it. I recommend giving this kit a go if it is something of interest to you. I hope this article has helped you on your quest to find your next vaping kit. Please leave any questions or comments below, we always love hearing from you.